Other parts of the U.S. can count on a yearly hurricane or tornado which sweeps through, leaving disaster in its wake. In California we have earthquakes and wildfires. Right now we've got quite a few fires up and down the state, and yesterday two firemen were killed north of Los Angeles when their truck rolled down a fiery hillside. Many homes have been destroyed and thousands of acres of land are charred and smoking after being roasted by flames. This week the Palos Verdes Peninsula caught fire on the hill above our town. We stood outside on the lawn after dark, watching the line of flames light up the night sky. The next day the area north of downtown Los Angeles caught fire. Of course, we've had quite a chilly summer, lots of "three outfit days" where you wake up and put on jeans and a sweater, change to shorts and a tee in the warm afternoon, and then throw on a jacket in the cool evening. But summer eventually comes to the South Bay in September and early October, just when the local department stores start stocking parkas and woolly socks. It's ironic that when the beach weather finally comes, there are no bathing suits to be found! Of course, the fires started right as our So Cal summer roared in with high temps and low humidity- the perfect combination for massive destruction through fire. 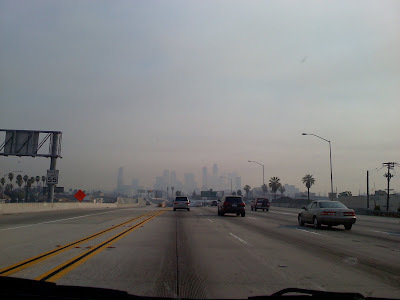 Yesterday we drove through downtown L.A. (barely visible in the photo above), which looked wickedly smoggy but was actually just sooty from the fires. 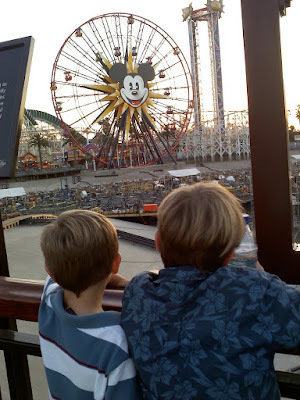 In the afternoon we decided to drive to Orange County and hit up the rides at Disneyland. The OC was HOT, but Disneyland was empty and we didn't wait to board any rides. Of course, we had to stop by and check out the progress on the work Michael is doing at Disney's California Adventure - a huge show called World of Color that is going into the giant lagoon (currently drained) in the middle of the Park. They put in a visitor's center where you can see elements from the show through artist's renderings and video clips. There was no mention anywhere of the specific key element that Michael is working on, which led us to wonder if it's a secret. And so just in case it is, I won't mention it! The show opens in Spring of 2010, and I can't wait!